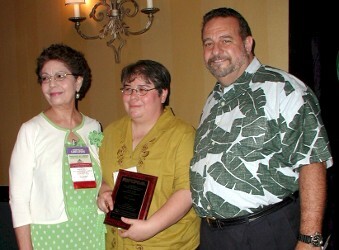 CHICAGO - The Trejo Librarian of the Year (LOTY) Committee is pleased to announce that Elva Garza, managing librarian of the St. John Branch of the Austin Public Library, has been selected as the recipient of 2006 Trejo Librarian of the Year Award. The Trejo Foster Foundation for Hispanic Library Education (TFF) sponsors the award. TFF provides leadership, public policy advocacy, research, and library education that enhances library and information services to Hispanics/Latinos in the United States. The LOTY committee recognized Garza for her outstanding local involvement strongly advocating for the Latino and immigrant community, her significant library work and community outreach, and her active nationwide contributions to REFORMA, the national association to promote library and information services to Latinos and the Spanish-speaking. "Elva is, quite simply, a remarkable woman and a dedicated and imaginative librarian," said Mary Ellen Isaacs, co-chair of the 2006 Día de los niños / Día de los libros. "She exemplifies the mission of the public library as a critical connecting point for the community. She is deeply committed to ensuring access to the resources of the library for all members of the community, and has worked with others to remove barriers that prevent access." The award will be presented at the REFORMA Fundraiser on Sunday, June 25, 2006 at the American Library Association (ALA) Annual Conference in New Orleans. The Trejo LOTY committee members are: Libbhy Romero, Chair; Loida Garcia-Febo; Mario Gonzalez; Maricella Nuñez; and Marie St-Pierre.